Being Indian, specifically Gujarati, mangoes have always been a huge part of our diet. Pickled mango, mango lassi, mango ice cream, to name a few. ‘Keri Ras’ is a delicious pulp of mangoes made in every Gujarati’s home during the mango season. It is my favorite. My mom would make it for us at least 2-3 times a week to have with our traditional Gujarati meal. Using good quality mangoes is key for making good ‘Keri Ras’. You may be asking yourself, “what’s so special about pure pureed mango? It’s practically the same as eating mango pieces!” No, I promise you it isn’t. I really can’t explain the difference, but it’s something about eating spoonfuls of home-made pure mango puree in a bowl, like a soup, that’s just out of this world. My brother and I always thought of it as dessert everyday for dinner =) Traditionally people enjoy this fresh mango puree with some home-made Puri on the side, small wheat flour spiced tortillas deep fried in oil. The combination is a deadly, and is worth trying at some point if you haven’t already. You can probably already guess that come mango season, we practically have mangoes pouring out of our house. Every time one of our parents come to visit, they bring cases of delicious mangoes. One day as I was pureeing some of these mangoes to enjoy with our Gujarati meal for dinner, I started to think of other possible uses for this Mango Puree. Of course you already know that Vegan Richa’s Mango Curry was one dish that came out of it (which if you haven’t tried yet, is delicious! ), but I also started thinking of other desserts I could make. My Fresh Mango Coconut Chia Seed Parfait recipe has always been a huge hit, and I was craving another mango-based dessert. So for my first creation, I present to you my Mango Mousse Parfait! I kept the flavors pretty simple since I wanted to highlight the mango flavor as much as possible. 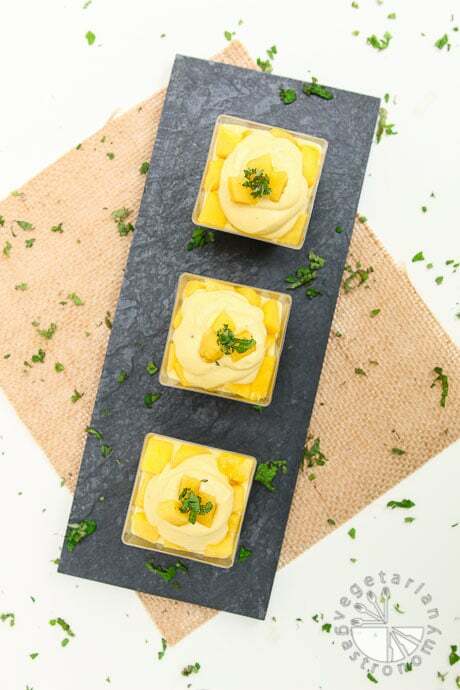 The richness of whipped coconut cream, combined with mango puree, layered in between freshly diced mango pieces, and topped with a small amount of finely chopped fresh mint…I was in mango-coconut bliss once again! In the process of developing this recipe, I also discovered that the Trader Joe’s brand canned coconut cream works really well to make coconut whip cream! I typically use Thai Kitchen full-fat coconut milk, but the TJ coconut cream produces thicker coconut whip in my opinion. Since we now have a Trader Joe’s that opened walking/biking distance away, I decided to try out their can of coconut cream for the first time, and it was awesome, to say the least! Thickened perfectly in the fridge with minimal liquid remaining. However, when I compared the ingredients of the TJ coconut cream to the Thai Kitchen Coconut milk, the Thai Kitchen brand does not have any preservatives and has fewer ingredients compared to the TJ coconut cream. I believe Thai Kitchen does make canned coconut cream, but I have yet to find some. So depending on your preferences and what you’re using the coconut whip for, you may prefer one brand over another. Either way, both brands still work well in this recipe. Just be sure to use 2 cans of full-fat coconut milk for every 1 can coconut cream. 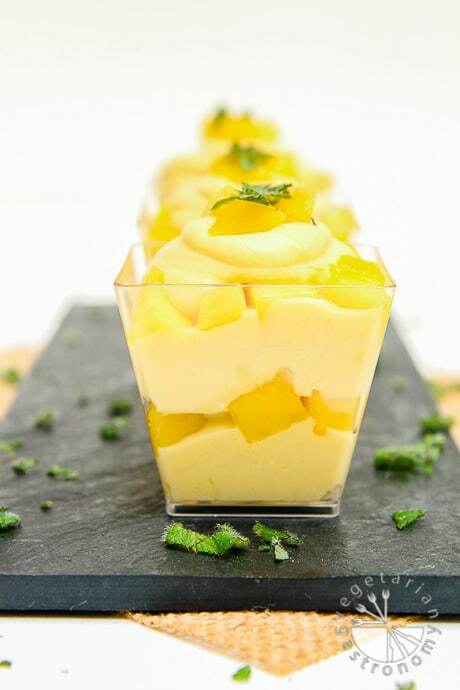 This Mango Mousse Parfait is very easy to make, requires simple ingredients, and tastes amazing! It’s the perfect summer treat to make for your family, or to make ahead of time and serve as dessert for a dinner party. And if you’re wondering where I got these super cute small square disposable mini party cups, it was here from Amazon. Grab a mango and a can of coconut cream and make this today! If you do, be sure to let me know in the comments below, and tag me on Facebook or Instagram @vegetariangastronomy , #vegetariangastronomy, so I don’t miss it! 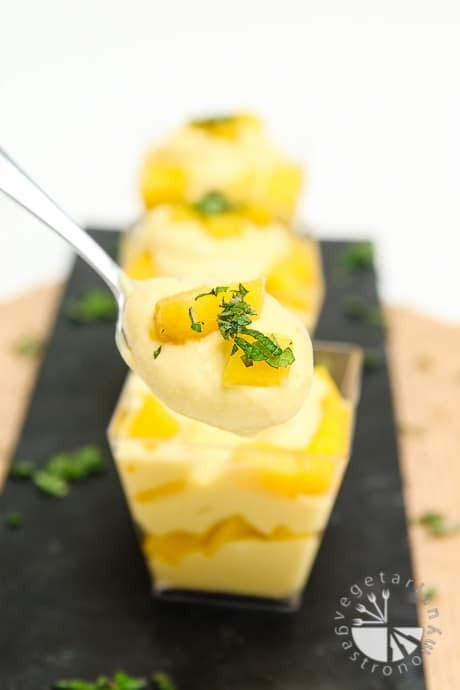 Layers of creamy vegan mango mousse paired with fresh delicious pieces of mango! Once you are ready to whip, remove the can(s) of coconut cream (or full-fat coconut milk ) from the fridge without shaking it. Slowly flip the can over and open it. Remove any coconut water into a cup (the part that did not solidify), and scoop out the solidified coconut cream into the chilled bowl. The coconut liquid will not be used in this recipe. If using full-fat coconut milk, repeat and scoop out the solidified coconut cream from the second can as well. Using a stand mixer or a electric hand mixer and beat until fluffy. Start on low speed and work your way up to a higher speed until you start to see stiff peaks forming. Half way through, add the powdered sugar and continue to beat. You should end up with about 2 1/2 cups coconut whip cream. (Note - depending on how sweet your mangoes are, you may need more powdered sugar. I had sweet mangoes and therefore only needed 2 tbsp of the powdered sugar.). 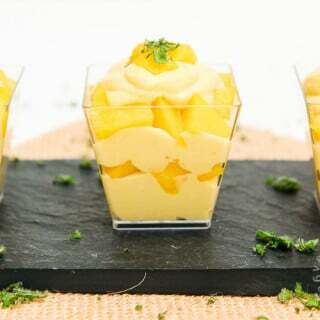 Place the mixing bowl with the prepared coconut whip cream in the fridge until the mango puree is ready. Peel the three large mangoes and completely puree the pulp in a blender with the small amount of fresh lemon juice (I used my Vitamix ). You should have about 2 cups of pureed mango. Place in the fridge to chill for 10 minutes. Remove the pureed mango and coconut whip cream from the fridge. In batches, slowly fold the mango puree (~2 cups) into the coconut whip cream (~2 1/2 cups) using a rubber spatula. Be sure not to whisk or mix fast. 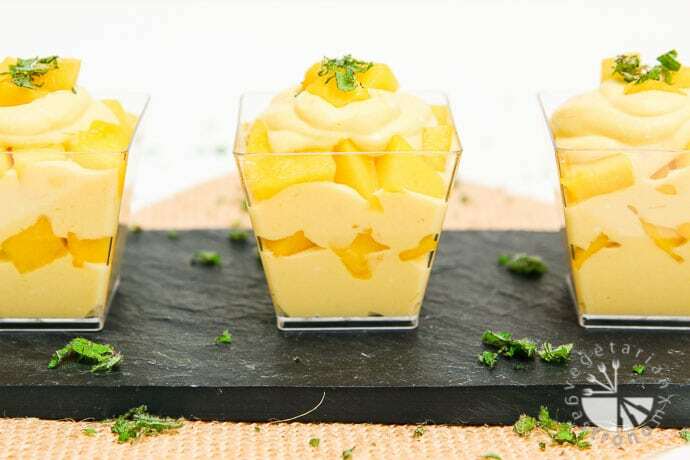 Once the mango puree is completely folded in, refrigerate the mousse for a minimum of 2 hours in the mixing bowl. Remove the mousse from fridge. Fill a ziplock bag with the mango mousse, and cut off one corner of the bag to create a pipping bag (or simply use a standard pipping bag with circular large tip). 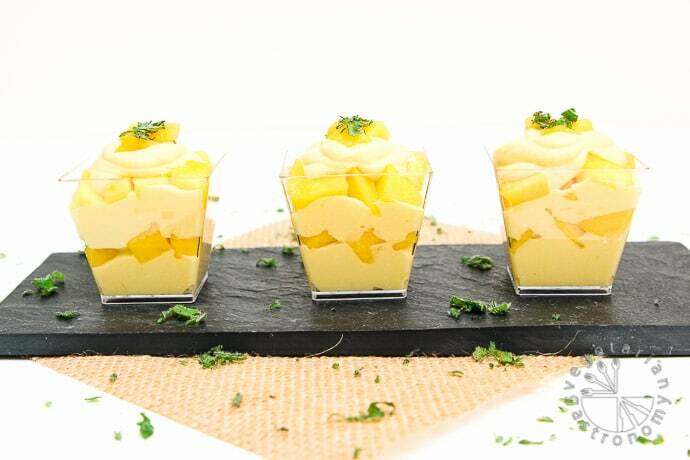 In each serving cup, pipe a layer of the mango mousse, followed by a layer of freshly diced mango. Repeat with as many layers as you wish, ending with some diced mango. Top with some finely chopped mint. Repeat to make more servings of the parfait. 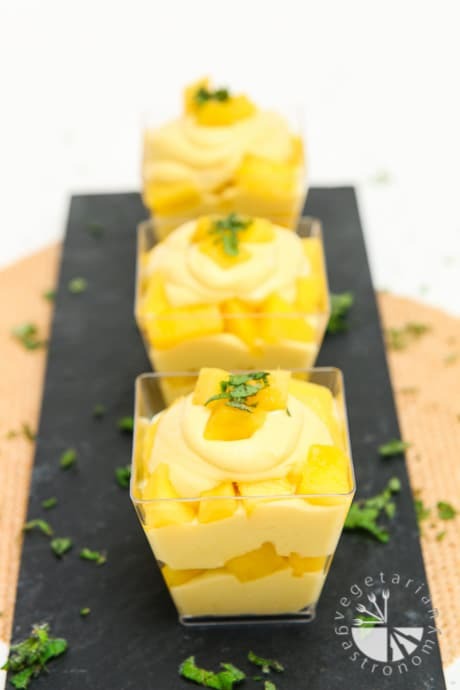 Enjoy immediately, or place the prepared mango mousse parfait back in the fridge until ready to serve! Coconut Cream - Trader Joe's Can Coconut Cream works great for making coconut whip cream, but does have a few more ingredients compared to Thai Kitchen brand full-fat coconut milk (which has no preservatives). Depending on your preference, both work just as well, just be sure to use TWO cans if you decide to go with Thai Kitchen full-fat coconut milk so that you have plenty of coconut cream (the thicker more solidified part). Ratios - Be sure you have ~2.5 cups coconut whip cream and ~2 cups mango puree before you fold them together to make the mousse. 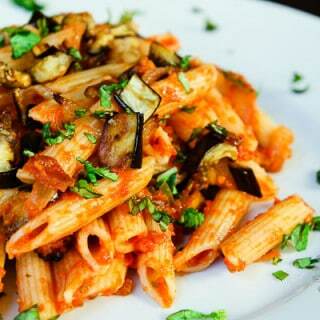 If your amounts vary significantly from this, it may affect texture and taste. Sugar - I prefer using powdered sugar for this recipe, but if you are looking for a no-refined sugar option, you can use pure maple syrup instead of the powdered sugar. If using maple syrup, it may affect the consistency of the mousse slightly since you are adding additional liquid into the mix, but this option should still work fine with this mousse. This has been by far one of the best mousses i have ever seen, hands down!!!! I really need to make this at home soon!!!! 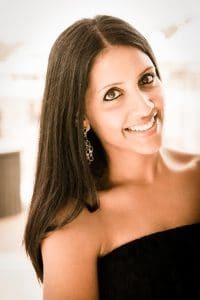 Absolutely gorgeous Anjali and the pictures are amazing! Im completely SOLD! Aww that means a lot...thank you Reshana! 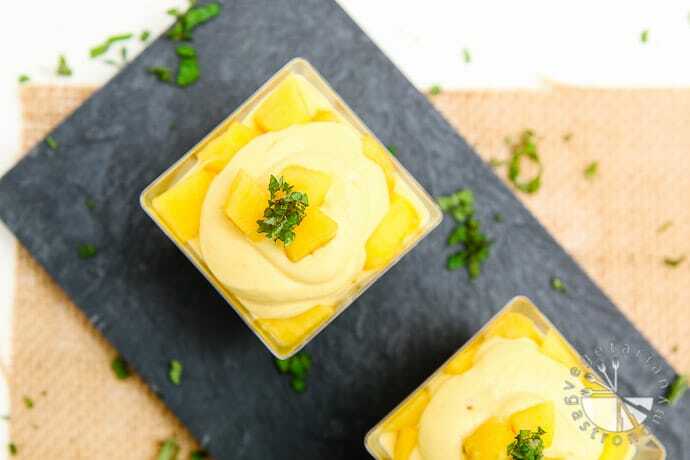 If you love mangoes (and I know you do), this mousse is delicious and so easy to make! Hope you get a chance to try it out! Looks sooo creamy and delicious --I'll put this on my make it list!!! Thank you! You will love it...it's so good! Let me know once you make it!! Haha thank you! This is one of my favorite go-to desserts! You will love chia pudding...you can really get creative with it. Let me know how you like it if you try it out! My husband would probably complain that I always take pictures of the food I cook before he gets to try it! But otherwise, they love tasting my creations (most of the time ha!). Thank you for following and thanks for the kid words! Can't wait to make this. Can the mousse be made the day prior and kept refrigerated? Yes absolutely, I typically make it a day in advance to let it set better! You will love this mousse! Let me know how it turns out! Awesome!! Thank you so much for trying it out! Glad you loved it. Thanks so much for following! Try the chocolate version next! Yes of course I remember you!! Thanks for following and that's awesome that you guys loved this!! This one and my Chocolate Chia Pudding is my GO-TO when it comes to potlucks or coming up with an easy dessert to make! Try the chocolate one next, although I've been making this mango version the entire summer for breakfast! thanks again! Let me know if you're ever looking for something in particular! It is a mango season,and with coconut ! Perfect. 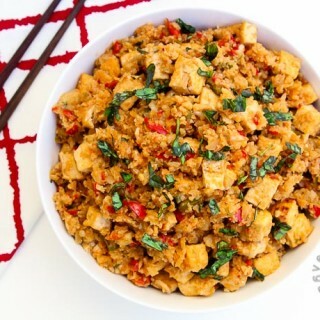 This looks delicious so I will be making it soon. Loved one reviewers idea of using mixed fruit, kiwi and berries, the contrast will make for a beautiful presentation. I’m wondering how u calculated such low carb count? I replaced sugar w stevia in FitnessPal calculator and came out w a min of 12g of carbs. Thanks Renee! yes...the colorful berries definitely makes for a beautiful dessert! My chocolate chia pie is also just that and all the berries give gorgeous flavor. As for the low carb count...i'll double check the calculations for this recipe. I use an automatic nutritional calculator on my recipe cards and there's no way i can 100% say that they are accurate. It does make mistakes sometimes, and the actual ingredient is often different from what I intended. I try my best to verify everything though, so I'll double check!